During any of the several recent catastrophic blizzards that have draped the country with snow, you might have seen people tagging their photos #sneckdown. No, it’s not a protective garment you wear to keep your neck snow-free (although that could also come in handy!). It’s a word coined by transportation geeks. Neckdowns are often seen as part of road diets—where one or more lane of a street is given back to pedestrians, bikes, or transit. When it snows (a lot), it essentially turns an entire city into a data-tracking system—which can record the way people move through it. Slowly, paths are carved through the snow by cars, plows, and pedestrians, with the most heavily traveled routes eventually revealing the pavement below. What you start to notice is that cars drive in a very narrow area compared to the width of the roadway, revealing untouched mounds of snow around the corners of the streets and intersections. The snow temporarily shows where neckdowns might be possible by illustrating the space that’s rarely used by cars. 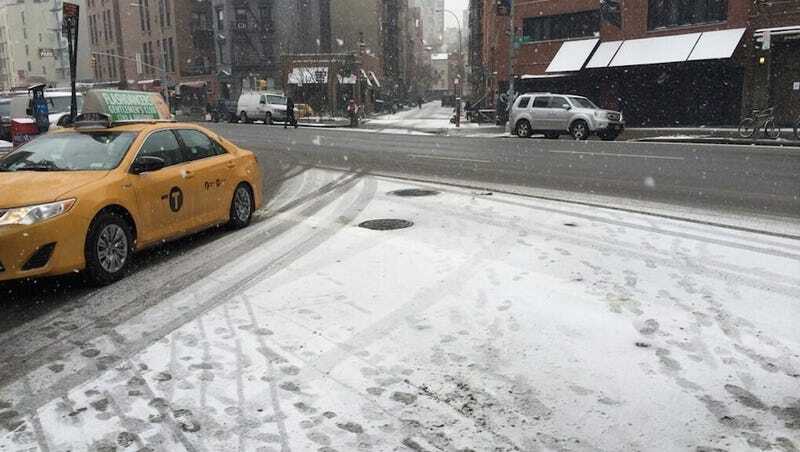 In 2011, Eckerson made this video of the phenomenon, calling the temporary curb extensions “Snowy Neckdowns.” In 2014, the #sneckdown hashtag really caught on, and that season’s wave of storms spawned articles at Streetsblog NYC and BBC News. While it’s fun to imagine the possibility of a large pedestrian plaza or traffic island in the middle of a wide street, the great thing about sneckdowns is that they cost absolutely nothing. Transportation planners spend lots of money funding traffic studies to understand how people and vehicles use streets, and this is essentially a free way to test out their theories. If you look at some of the changes implemented in New York City to improve the pedestrian experience, they look an awful lot like a sneckdown. Since so many states currently have snow on the ground, you’ll likely be able to spot sneckdowns in action right now in a city near you. It’s a nice activity to pass the time as you wait for the snow to melt sometime in May. This article was originally published on February 7th, 2014.